Trypophobia, commonly known as “fear of holes,” is linked to a physiological response more associated with disgust than fear, a new study suggests. Trypophobia is not officially recognized in the American Psychiatric Association’s Diagnostic and Statistical Manual of Mental Disorders (DSM). Many people, however, report feeling an aversion to clusters of holes—such as those of a honeycomb, a lotus seed pod, or even aerated chocolate. Previous research linked trypophobic reactions to some of the same visual spectral properties shared by images of evolutionarily threatening animals, such as snakes and spiders. The repeating pattern of high contrast seen in clusters of holes, for example, is similar to the pattern on the skin of many snakes and the pattern made by a spider’s dark legs against a lighter background. “We’re an incredibly visual species,” says Vladislav Ayzenberg, a graduate student in the Lourenco lab and lead author of the study, which appears in PeerJ. “Low-level visual properties can convey a lot of meaningful information. These visual cues allow us to make immediate inferences—whether we see part of a snake in the grass or a whole snake—and react quickly to potential danger,” Ayzenberg says. It is well-established that when we see images of threatening animals it generally elicits a fear reaction, associated with the sympathetic nervous system. Our heart and breathing rate goes up and our pupils dilate. This hyperarousal to potential danger is known as the fight-or-flight response. Clusters of holes may be evolutionarily indicative of contamination and disease—visual cues for rotten or moldy food or skin marred by an infection. The researchers wanted to test whether this same physiological response was associated with seemingly innocuous images of holes. They used eye-tracking technology that measured changes in pupil size to differentiate the responses of study subjects to images of clusters of holes, images of threatening animals, and neutral images. Unlike images of snakes and spiders, images of holes elicited greater constriction of the pupils—a response associated with the parasympathetic nervous system and feelings of disgust. In contrast to a fight-or-flight response, gearing the body up for action, a parasympathetic response slows heart rate and breathing and constricts the pupils. “These visual cues signal the body to be cautious, while also closing off the body, as if to limit its exposure to something that could be harmful,” Ayzenberg says. Clusters of holes may be evolutionarily indicative of contamination and disease—visual cues for rotten or moldy food or skin marred by an infection, the researchers theorize. 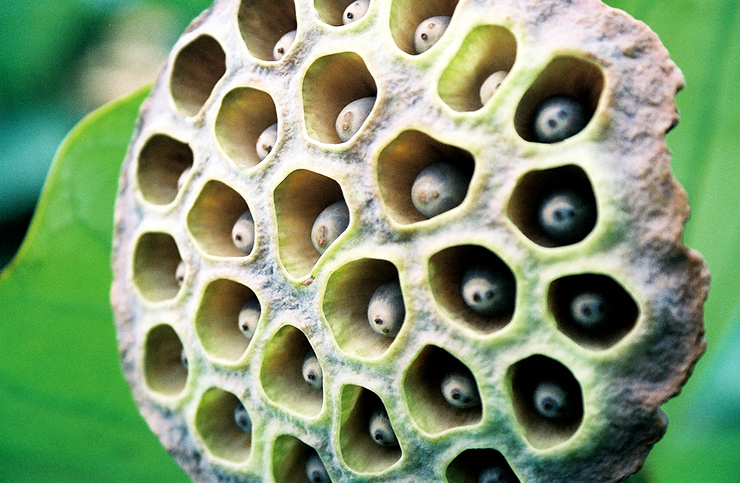 The subjects involved in the experiments were college students who did not report having trypophobia. “The fact that we found effects in this population suggests a quite primitive and pervasive visual mechanism underlying an aversion to holes,” Lourenco says. Since the time of Darwin, scientists have debated the relation between fear and disgust. The current paper adds to the growing evidence that—while the two emotions are on continuums and occasionally overlap—they have distinct neural and physiological underpinnings. “Our findings not only enhance our understanding of the visual system but also how visual processing may contribute to a range of other phobic reactions,” Ayzenberg says. Meghan Hickey is also a coauthor of the paper. She worked on the experiments as an undergraduate psychology major, through the Scholarly Inquiry and Research at Emory (SIRE) program, and is now a medical student at the University of Massachusetts.